In very old champagnes (ie pre 1900) the taste shifts slowly from biscuit / bready towards a stronger more mushroom-y tang. The bubbles lessen but if you have the magic balance of acidity and fruit it will remain drinkable. 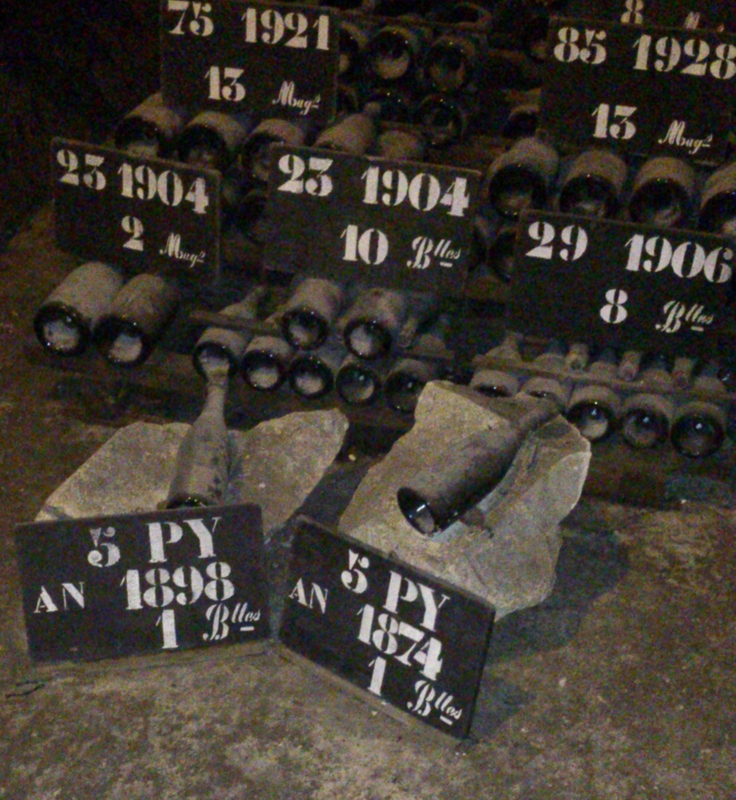 Pol Roger still have a number of bottles of 1870; though Pommery (their pre-World War One rivals for Churchill’s patronage) are down to just one bottle of the 1874 (another famous vintage and one that made vintage-dated wines de rigeur in England in the late nineteenth century. 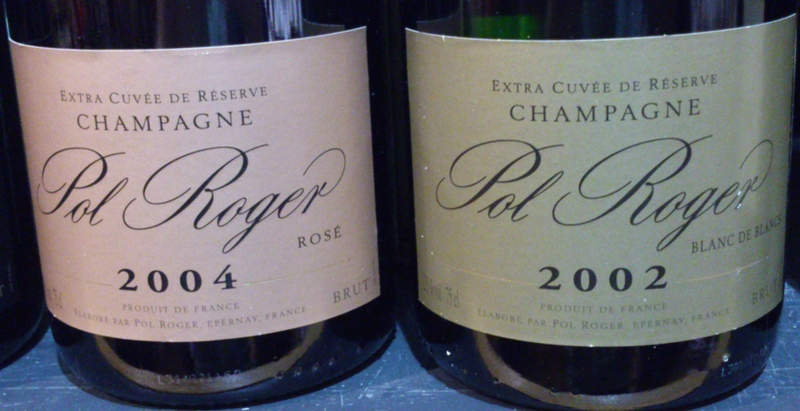 Pol Roger (the ‘Pol’ was added to the family surname in 1900 by Pol’s sons in his honour) is still a family company – one of the few. To survive such firms need their own vineyards. Pol Roger have 89 ha, having cannily started buying in the 1950s when prices were not at their current 1 million euros per hectare (that’s the size of two football pitches, said Cassidy). Their seven wines (all of which were presented last night) started with the Pure Brut (a zero dosage wine with no added sugar). This bone dry style is becoming more popular in the UK (the growing UK preference for Prosecco suggests the market is polarising between drier and sweeter styles of sparkling wine). Pol Roger age this wine for 36 months pre disgorgement (unlike the standard 15 months) and it showed in the integration, length and balance of this apparently delicate wine. Next up was the White Foil Brut NV Reserve. Mostly from the excellent 2008 vintage this is the backbone of the firm’s sales. One-third each Chardonnay, Pinot Noir and Pinot Meunier it was designed, said Cassidy, as wine you could ‘quaff with impunity at any time of day, and preferably more than one glass’. It was the wine for William and Kate’s wedding – a huge boost for the firm. The assembled tasters at the very hospitable Bridge St Wine bar were split about 50/50 between the Pure Brut and the White Foil Brut (which has around 8.5g/litre of residual sugar). Then we were on the heights of vintage wines. All these wines are 60/40 Pinot Noir and Chardonnay (no Pinot Meunier since 1959) and all have the same 8.5 g/litre of residual sugar (though vintage differences make the 2002 Blanc de Blanc feel slightly sweeter in the mouth). 2004 is an excellent vintage (though 2002 is better) and this wine (despite its 9 years ageing before disgorgement) still struck me as having some way to evolve. After a detour to the gorgeous 2004 Rosé (Oeuil de Perdrix in its slightly tawny pink colour, summer fruit and brioche nose) we homed in on the 2002 Blanc de Blancs (just Chardonnay). The 2002 and vintage has everything. Cassidy argued a stronger fruit character gives it the edge over the fabled 1996 wine. Drink it in a standard glass rather than a flute he suggested; for this is a great white wine by any standard that just happens to have bubbles. Then to the 2000 vintage of the company’s Prestige Sir Winston Churchill Cuvée (the top of the range). Churchill first discovered Pol Roger in the shape of the 1895 vintage and went on to 1898, 1911, 1914, 1928, 1945 and 1947. The 2000 vintage is fundamentally a Blanc de Noirs with 80-85% Pinot Noir and the balance of Chardonnay. On the nose it had a slightly lifted quality (a touch of cedrat); in the mouth rich and more fruit quality than any of the other wines. It’s powerful, full-bodied and perfect for food. The Churchill Pol Roger relationship was cemented through the May December friendship between Odette Pol Roger and Churchill who met at a dinner to celebrate the liberation of Paris. We finished with the Demi-Sec (30 g/litre of sugar). A rare style these days. Apparently Fortnum and Mason’s are the biggest customers, saying, said Cassidy, something about their demographic profile. Enough said perhaps. A wonderful tasting, wonderfully presented by a man who knows both the history and the wines. Thank you Pol Roger! This entry was posted in Uncategorized, What I've been drinking and tagged Pol Roger. Bookmark the permalink.